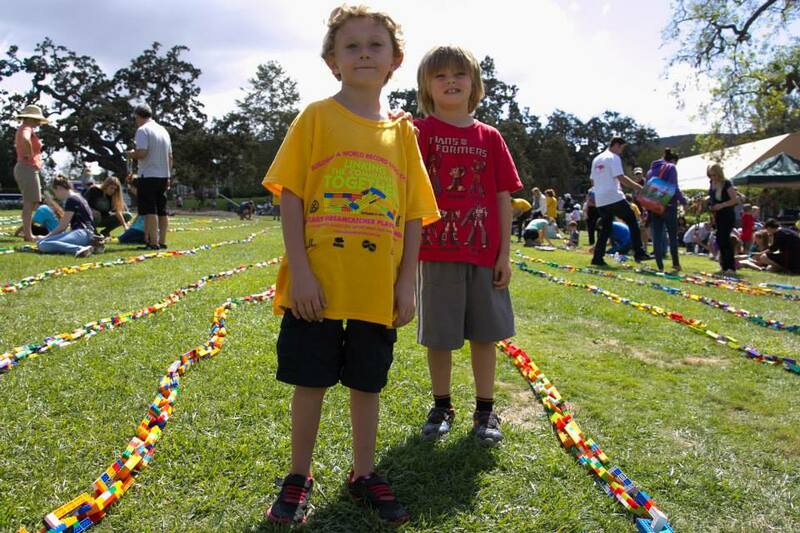 On Saturday, September 27th, 2014, families from all over Ventura County, in collaboration with Conejo Recreation and Park District, Rotary International, and us, Play Well TEKnologies, attempted to break the world record for the World’s Longest LEGO® Chain. The previous record was 565 meters, set by families in Wilsau, Switzerland in 2003. In approximately 6 hours and 53 minutes, using over 190,000 LEGO pieces, 447 local residents created a new record measuring in at 902.51 meters (2961 ft.). It was part of a charity fundraising event to raise awareness for a state-of-the-art special needs playground called the Rotary DreamCatcher Playground. This event coincide with the 50th anniversary of the city of Thousand Oaks. At 3:03 PM, we added the last chain link which put us over 902 meters. It was an amazing event that we will never forget. Check out some of the photos of the event below. 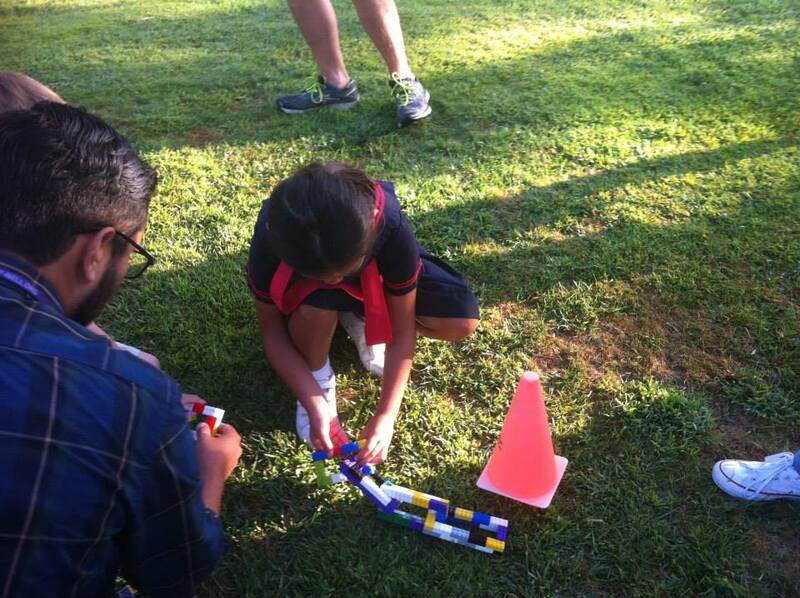 The first LEGO chain links were laid down by Alice at 8:08 AM. She was joining the parade to celebrate the 50th anniversary of the City of Thousand Oaks, but had time to build a few chains before then. 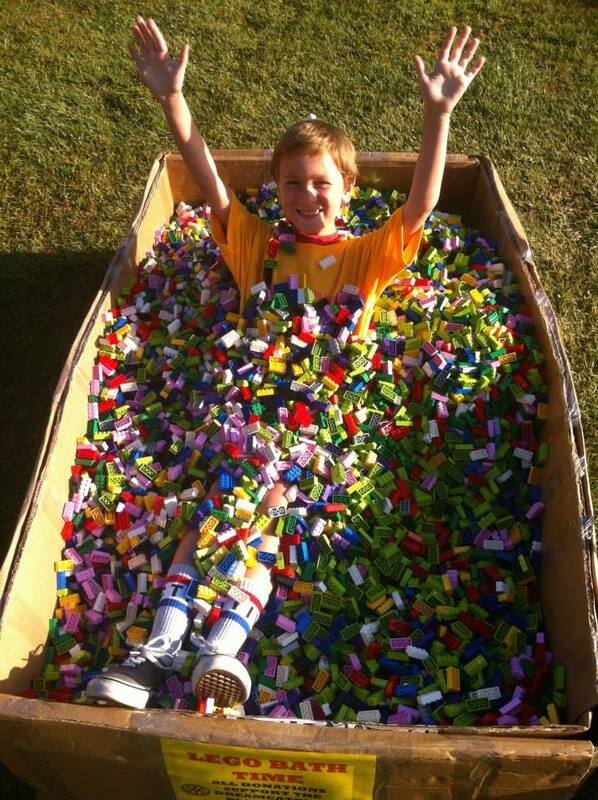 One of our builders, JJ, was able to lay in the LEGO bath. 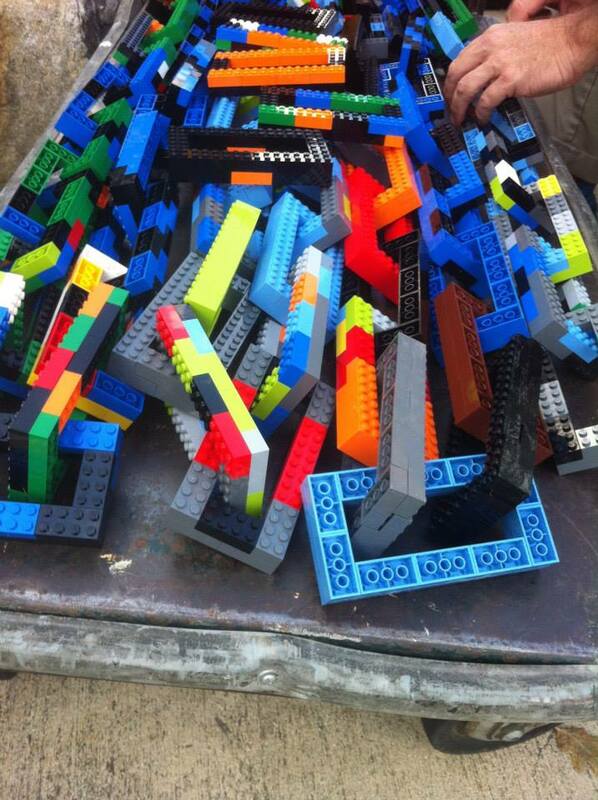 We eventually used all the LEGO bricks in the LEGO bath. 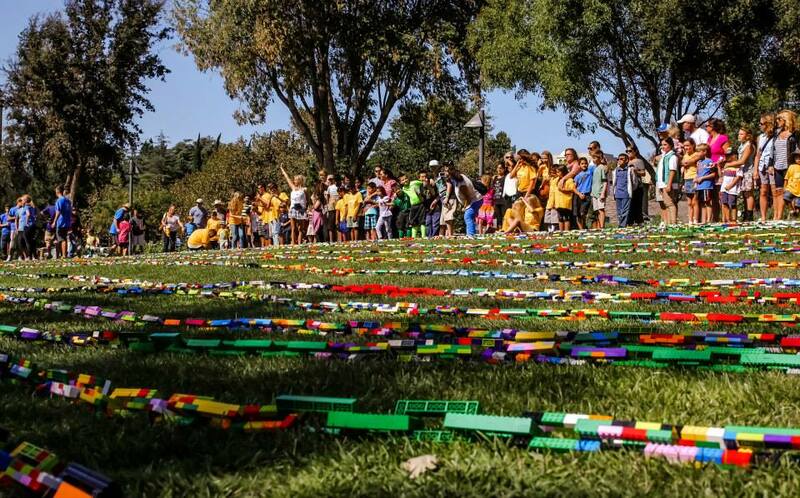 Here is more LEGO being shared, so we can complete this World Record LEGO Chain. These kids have a system when making their LEGO chains. Two builder focused as the build their LEGO chains in the LEGO bath. All these chain links are ready to be taken over to the LEGO chain. 20 2×4 bricks made up the chain. One of our builders, Colton, had been talking about this event all week. He was one of the first builders at the event in the morning. This builder liked to get his chains done while sitting in a bucket of LEGO. The chain at this point measured over 450 meters. 106 meters shy of the record. We are almost finished with the LEGO chain at this point. We constantly measured to chain to see how far we were from the record. And waited till the very end to reveal the result. Here is some of the Play-Well staff that helped coordinate the building of the LEGO chain. Two amazing Play-Well staffers who helped out, Michael Sidebottom and James Castellano are missing from this picture, but are just as awesome. We lined up all the participants to let them know what the result was. And the final result was…. 902.51 meters, breaking the previous record by over 350 meters. It took approximately 6 hours and 53 minutes to do it. 447 people participated in this event over the course of the day. We then attempted another World Record. All the residents cleaned up 190,000 LEGO bricks in the span of 10 minutes and 11 seconds. We don’t know if there was a record before then, but there should be one now. Thanks everyone that participated in this amazing event. To see more pictures from the event, visit our Play-Well Facebook Page. 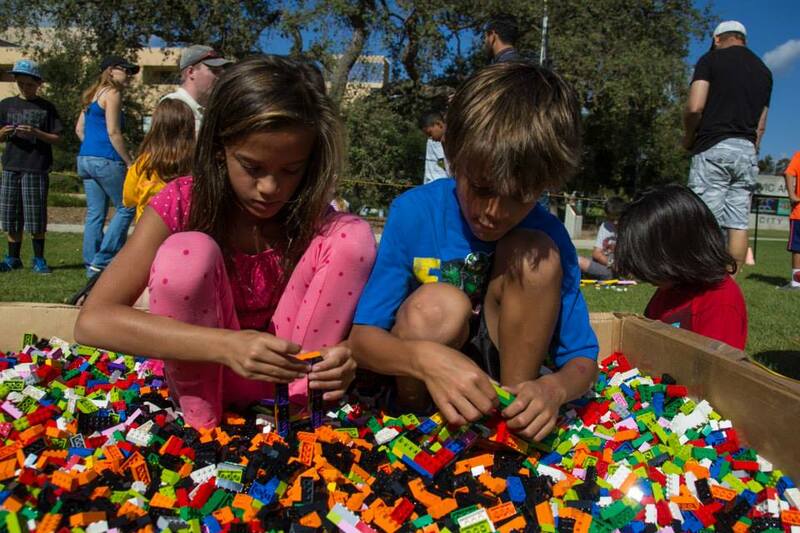 If you’d like us to help your community break another LEGO® record, email Jeff at jeff@play-well.org. On September 25th, we were invited by Google to participate in their Kids Develop It Event in Denver. We brought out many of our LEGO NXT projects, including our LEGO maze, claw, and conveyor belt. Thanks Google for having us! If you’d like us to come to your corporate event, simply email us here. We built these kid size LEGO cars that six of our students are driving in the San Anselmo County Fair & Parade this Saturday, September 28th. This vehicle has one of our 40 tooth gears on it as a steering wheel. Email us if you’d like us to be a part of your parade.